I have been to Greece twice. The first time was with the USAMU traveling to Crete for the 1998 IPSC European Championships. It was on that trip that I fell in love with the food, enjoying my first Greek salad at tiny little restaurant not far from the Parthenon. Last October I had the honor of representing Team USA at the IPSC World Shoot in Rhodes. It was an amazing trip and I took every advantage of indulging in souvlaki with tzatziki, seafood and, of course, more Greek salad! I enjoy the flavors in Greek food – the sharpness of feta, the coolness of cucumber, the bite of garlic and the unique seasonings. Practically the only way I am going to get my Greek fix here in northeast Montana though is if I make it myself. And so, Greece is the next stop on my mulie meat world tour. It’s Greek with an American twist! 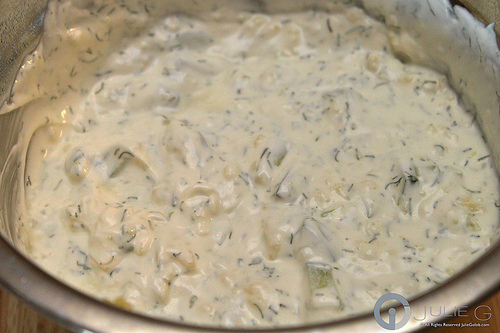 I love me some tzatziki! Just ask my good friend and U.S. Ladies Production teammate Kippi Leatham. We both happen to be huge fans (and maybe even a bit obsessive) about garlic. While we were in Rhodes enjoying the sights and food we had tzatziki with almost every meal. The best we found was at a little eatery called Oscars. It was loaded with lots of garlic – YUM! 5 cloves garlic run through a garlic press. Mix and refrigerate. With the tzatziki chillin’ in the fridge, next up I prepped the venison patties. Mix onion, pine nuts and seasoning together. Combine the mixture thoroughly with the ground venison. Form small, slider sized patties that fit inside your hand. Cut buns and place on baking sheet with the cut sides up. Whisk the butter and lemon together. Brush onto each bun. 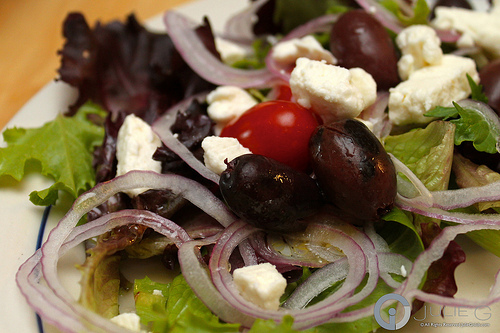 lettuce & herb mix, grape tomatoes, sliced cucumbers, finely sliced red onion, kalamata olives and feta. Cut vegetables accordingly and mix with cheese into a salad. Whisk together olive oil, lemon juice and olive juice. Pour over salad as a dressing and toss. Tzatziki is best prepared hours in advance. This recipe calls for a significant amount of garlic butit can be reduced to one to two cloves if desired. Cut and prep dinner buns on a baking sheet and brush with lemon butter. Preheat oven to 400 degrees. Prepare Cuisinart Griddler, grill pan or grill on high heat (sear). Mix vegetables and dressing for Greek salad while the oven and grill preheat. 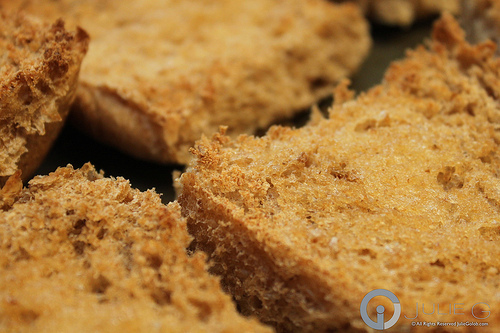 Once preheated, place the buns in the oven to toast lightly to a golden brown. Place patties onthe grill and sear. 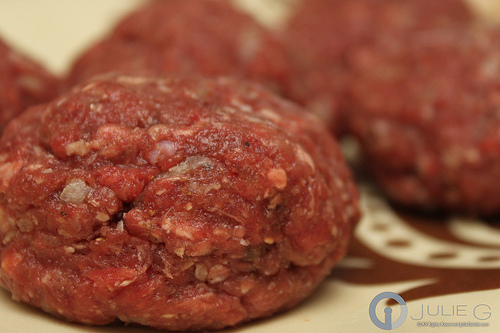 The thicker the patties, the longer the cook time. Four minutes on a Griddler(searing both sides) results in medium to medium well doneness. Plate two toasted buns. 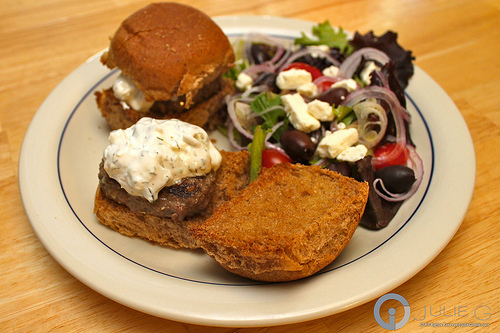 Add a patty to each bun with a generous dollop of tzatziki. Place theother half of the bun on top to form a slider. Serve with the Greek salad.